Welcome home to the Winston Churchill, a prestigious luxury coop in Spuyten Duyvil South Riverdale. Welcome home to the Winston Churchill, a prestigious luxury coop in Spuyten Duyvil (South Riverdale). 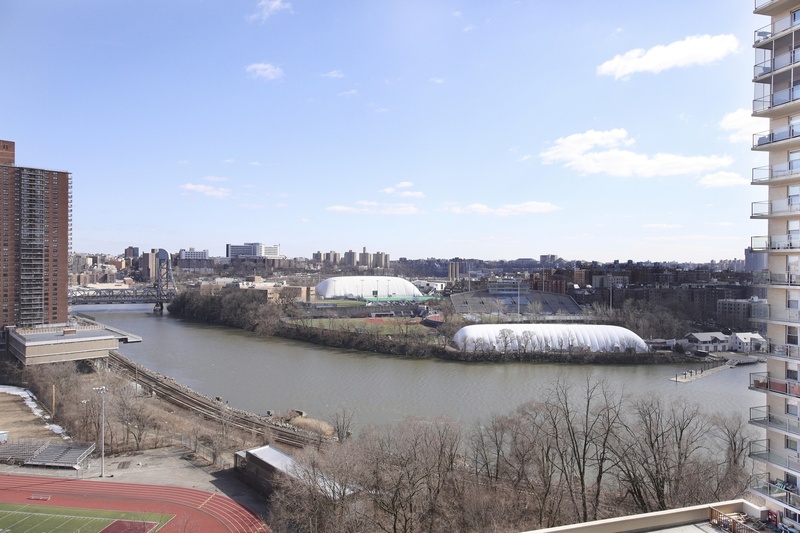 The minute you walk into this 8th floor corner 2-bedroom 2-bath, you will immediately notice the beautiful and sunny south-eastern exposure and the stunning view of the Harlem River. Enjoy your morning coffee or entertain a crowd on your private 23-foot wrap-around terrace with access from both, living room and master bedroom. Large galley kitchen has been updated and features granite counter tops, stainless steel appliances, built-in dishwasher and a sizable pantry. The updated main bathroom features a bath tub and the updated windowed en-suite master bath features a walk-in shower. Master bedroom features two exposures, two large closets and a dressing area. There are plenty of additional closets including two large walk-in closets near the entrance. Original hardwood floors are in beautiful condition throughout. Pool, gym and central A/C are all included in the monthly maintenance. If you're searching for a stunning 2-bedroom don't miss this one! The Winston Churchill is a luxury coop with a 24-hour doorman, an Olympic-size heated indoor pool, saunas, 24-hour full-size gym, community room, children's playroom, private playground, 24-hour laundry, storage rooms, bicycle storage, indoor parking and is pet friendly! Convenient Spuyten Duyvil (South Riverdale) location is ideal for commuters just a 5 minute walk to the Spuyten Duyvil Metro North station for a quick 25 minute commute to Grand Central. Bus stop right outside for local buses Bx10 and Bx20 that can take you to the #1 train in just a few minutes, or a choice of Manhattan express buses BxM1 (east side), BxM2 (west side) and BxM18 (Wall St). Lots of great parks nearby, shopping area also nearby with a 24-hr pharmacy, stores and restaurants! This is your chance to buy a move-in ready luxury 2-bedroom apartment!